My daughter is the type of child who loves to copy EVERYTHING that you do. If I am combing my hair, then she is right there trying to comb hers to. If I am doing dishes, she wants to get involved. The same goes for brushing my teeth. If she sees me doing it, then she wants to climb up next to my bathroom sink and brush her teeth too! Oral hygiene in children is so important. I used to think "oh, they are just baby teeth and will fall out". But I have come to realize that I need to be diligent about taking care of my children's teeth because it is MORE than caring for the teeth themselves...it is about taking care of their whole mouth. Oralcryst Junior is a product that I have been recently introduced to and am so excited to be able to share it today! Oralcryst Junior is a product that is specially formulated for toddlers and children that can help them "chew away" cavity causing bacteria...naturally! Wow! Now this is exciting. This revolutionary new candy includes four effective ingredients that help kids naturally wash and chew away cavity-causing bacteria and optimize their good oral health. Children will love the great taste of this special treat and parents will love the many oral health benefits provided in each small candy. Let them enjoy two or more candies after meals, after brushing teeth, or as a treat before bedtime. Oralcryst Junior uses four natural ingredients to aid in protection of your child's teeth: -Ovalgen DC - A natural food in gredient contains natural livetin (immunoglobulins) from chicken egg yolk that helps maintain a low level of S. Mutan bacteria in the mouth...which are cavity causing bacterias. -Xylitol - A well-known natural sweetener that doesn't promote tooth decay and helps to neutralize the acidic condition of the mouth. -Calcuim & Vitamin D3 - Essential elements that build strong bones, teeth and healthy gums. For this review, I was sent all four flavors of Oralcryst Junior to try and they are all very yummy! 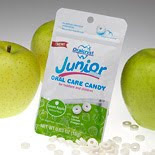 Oralcryst Junior comes in Green Apple, Orange, Strawberry and Grape flavors...all of which are very appealing to a toddler's taste buds! There are 40 candies per bag so you will have plenty if you have more than one child. The first thing that I love about Oralcryst Junior is the packaging. It has a Ziploc type of technology so you can re-seal the bag and all your candies don't spill out! My daughter LOVES these candies. She enjoyed the two that she tried and kept asking for more. It was a HUGE hit with her. 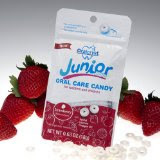 Oralcryst Junior candies are small so make sure you are supervising your child when they are enjoying them. Also, it is recommended that a child eats no more than 8 per day. Visit Oralcryst Junior and tell me which two flavors you would choose if you win. You do not have to be a blogger to enter, but you must have a valid email where you can be reached should you win. If you do not leave an email address, it must be where I can easily find it. This giveaway is open to US residents (except Hawaii and Alaska) and will end 4/14 at 11:59 pm EST. The winner will be chosen using random.org and will be notified by email. The winner will have 48 hours to respond, or another winner will be selected. Disclaimer: I received no monetary compensation for this post. I received Oralcryst Junior products for review purposes. All quotes are from the Oralcryst website and email. All thoughts and opinions are mine. The green apple and grape look good. very neat! I like the strawberry and orange. I would choose the Green Apple and Orange flavors. I tweeted about this giveaway at http://twitter.com/likwan/status/58734337981546497.